This photo of designer Megan Winters says it all. With an infectious joie de vivre, love of gold, glamour and graphic design, she infuses her work with a fearless combination of bold statement, pattern, and frequently pink! Join me for an ELLE DECOR sneak peek. In fact when she told her husband that their Lake Forest, Illinois home, in this month’s ELLE DECOR, was going to have no pink at all on the first floor, he looked at her askance. And sure enough, she couldn’t resist including the painting by Karina Gentinetta along with pink pillows and chairs in her family room, above, where everything pops against the Phillip Jeffries strié wall covering. 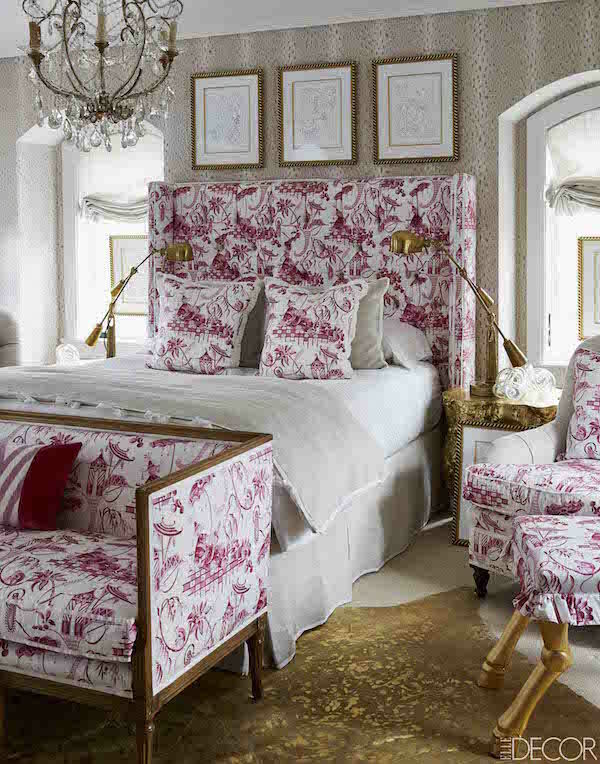 A pinky red plays a prominent role in the guest room as well, where a jubilant Lee Jofa toile and French vintage chandelier add a Parisian flair that Megan loves. The glamour of gold is a frequent feature in Megan’s rooms and here a Kyle Bunting rug echoes the brass and gilded touches throughout. Megan’s personal story might help explain her no holds barred approach to design. A dozen years ago she was diagnosed with brain cancer. Given six to eight weeks to live, she was determined not only to survive, but to rethink her life choices. After having designed the offices for her successful high end packaging company, friends had called on her to help with their homes. With new priorities, she realized this was her passion and embarked on a new career path. Happily she is now in complete remission and her design business and shop in Lake Forest are thriving. 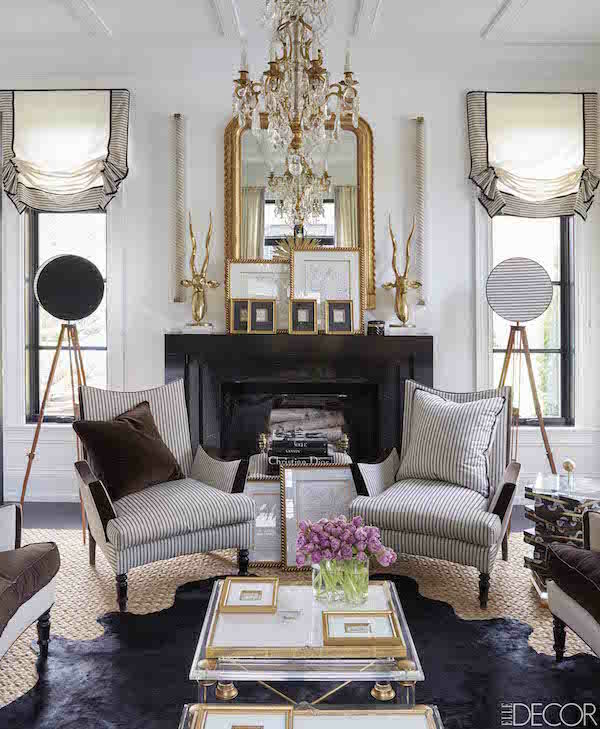 Above in the living room, black and white is tempered with golden touches as well for a room with whimsy and fashionable flair. The chairs, covered in a Rogers & Goffigon stripe, and the cocktail table are part of the Megan Winters Collection debuting this year. Continuing the dramatic black and white scheme in the house, Megan upped the ante in her husband’s office with extra bold gestures. Gutsy stripes in a Madeline Wenrib rug anchor the room, warmed up with the caramel tones of an antique burl wood desk, Eames desk chair, window treatments and frames in multiples. The textured wall covering is Ralph Lauren. Congrats to Megan – I’m sure we’ll be seeing much more of her soon. You can see the rest of the project online here. And there is lots more waiting in the May issue including Alexander and Kate Brodsky’s beautiful Manhattan apartment, featured on the cover and shot by Simon Upton. This entry posted in design, furniture, interior design. Entry Tags: ELLE Decor, interior design, Megan Winters Bookmark the permalink. 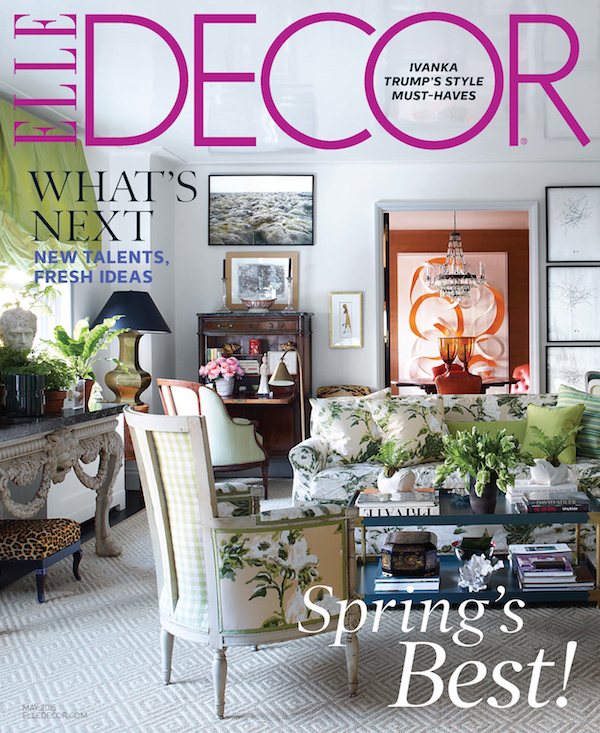 WOW, now I am Really excited about this issue of Elle Decor….Megan’s interiors are beautifully gutsy! I love it when there is no holding back in design! Elegant and Bold, awesome. Can’t wait for the issue to arrive in my box! I love her style and her story makes me love it even more! Megan is an inspiring, unforgettable,and Impressive woman and designer. I love her stunning color palette! Thank you for sharing this Stacey! Love this sneak peek, Stacey, and love Megan’s inspiring story. Making bold choices in life as well as in design can have powerful effects way beyond appearances. I have to believe that while Megan’s choice to go for her greatest joys in life may not have “cured” her, they surely raised her energetic vibration and in doing so perhaps her body’s resistance to disease. BRAVA! Yay! Furniture with pattern on the cover again. It’s back….. Thank you, Stacey, for sharing this story and posting that photo of beautiful Megan with one of my paintings which I am honored to be hanging in her home. Her talent is amazing! 80 queries in 0.423 seconds.